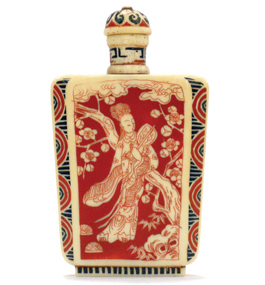 19th century snuff bottle from the collection exemplifies Chinese artistry and elegance. Chances are it’s been a while since you reached into your snuff bottle for a good, strong pinch of snuff. Indeed, you may have never seen one of these vessels, made to hold dried tobacco historically meant to be sniffed through the nostrils or rubbed into the gums. During the 18th century, the Qing Dynasty of China forbade smoking but touted the use of snuff, which was said to aid in alleviating colds, headaches and digestive problems. As snuff grew in social popularity, the bottles created to hold it became elaborate in design, including materials such as semiprecious stones, porcelain, metal, ivory, wood, lacquer, cinnabar and mother of pearl. Because of their workmanship and value, the containers came to represent gifts of great status. In 1964, Manhattan attorney Jack J. Katz and his wife, Therese, donated to Brandeis a collection of 47 antique Chinese snuff bottles in a variety of textures, shapes and materials. “Very few objects so elegantly display the variety of decorative materials used in old China. They epitomize Chinese ingenuity in miniature craftsmanship and are truly art that can be held in one’s hand,” says Aida Yuen Wong, chair of East Asian studies and associate professor of art history, adding that high-quality snuff bottles of the era can today command prices in the hundreds of thousands. Now safely housed inside the Robert D. Farber University Archives & Special Collections Department of the university library, the unusual collection is available to viewers by appointment. 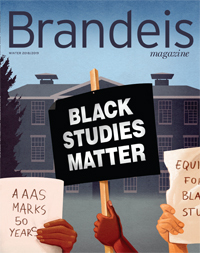 For more information or to make arrangements for a visit, contact woodrum@brandeis.edu.